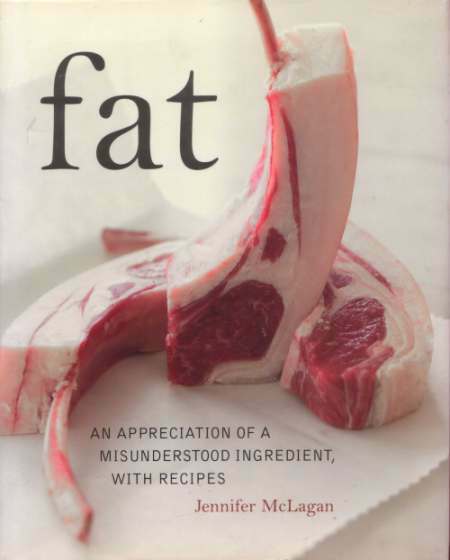 The last book I read by Jennifer McLagan was about offal and other often overlooked cuts of meat. ,an earlier volume, is about little more than fat, the stuff that we’re not really supposed to eat too much of, but which plays a huge part in our diet. McLagan’s theory is that fat shouldn’t be sidelined as universally bad, and she’s right. Fat is fine in moderation…it’s just that there isn’t much in the way of moderation where fat is concerned, hence the huge range of health problems over indulgence can provoke or exacerbate, but that’s another post. McLagan seeks to redress a situation where fat has become evil, something to be avoided at all costs. She suggests that fear of the problems that fat causes have been transferred to the fat itself, and people have become scared of the substance as a substitute for fear of some very serious diseases. McLagan attempts to argue that fat is good for you, but I remain unconvinced…fat is an important part of everybody’s diet and it has a solid nutritional and dietary purpose, but understanding is key. Fat is not good for you, and McLagan’s argument that it promotes a sense of well being and happiness displays the flimsiness of her point. is an interesting read, full of good recipes centred around butter, pork fat, poultry fat and beef and lamb fats, and as a cook book, it’s very absorbing. Dispense with the ‘fat is good for you’ manifesto and there still remains a glorious collection of recipes, with a compelling central theme and a clear purpose. The book is peppered with cultural context and observations, and dotted with quotations and sayings that sometimes misfire. The juxtaposition of a quote about butter from leading Nazi Hermann Goering against a Yiddish saying on the same subject was quite startling. Really, I don’t care one jot what the Third Reich thought about butter, and the inclusion of Goering’s quote was a clear mis-step. is admirable in its intentions, and there’s a bravery about it…it takes a position contrary to the prevailing cultural norm and fights the corner hard. As a cookery book, yes, absolutely, and it raises some interesting points about the nature of our relationship, not just with fat, but with food in general along the way…but it didn’t tell me anything new. I find it hard to argue that fat is good for you, but nor is it all bad, either, and it has a definite place in our kitchens and our diet, a place that, as McLagan points out, is out of balance and needs some redress. Being from a family of butchers, I added this to my Amazon wish list (where would I be without that?) but took it off after a week. I didn’t think that there was enough to fill a whole book – but I’ll try and get my hands on it. yes, as you say – fat is good – but not ‘good for you’ – there’s a difference! I have books on offal and bones which I’ve found very absorbing, useful and informative but I gacve this one a miss because I didn’t know how one could write a whole book on the subject without repeating themselves. What sort of recipes did it have?